Carpe Librum: I'm in the Top 1% of Reviewers on GoodReads! 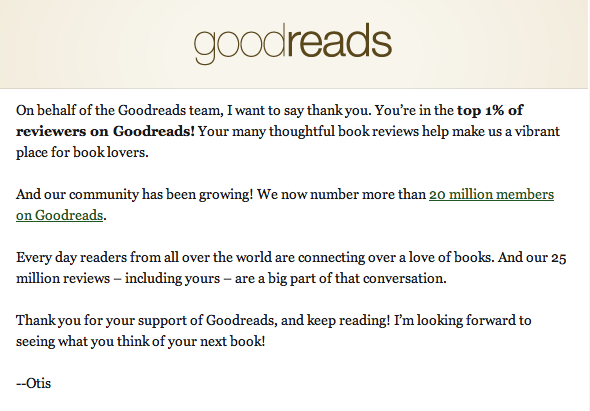 I'm in the Top 1% of Reviewers on GoodReads! I'm thrilled to announce that I'm in the top 1% of reviewers on GoodReads! 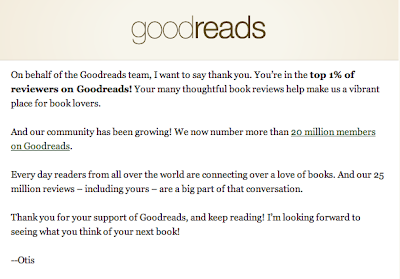 This is a significant achievement considering there are currently more than 20 million members of GoodReads! If you're a member of this brilliant site for book-lovers, then come and check out my profile. If you're not a member and you love books and reading then join now; it's the biggest and most popular website for book-lovers in the world. Which means that you published how many reviews? Hi Edith, I just checked and I've published 301 reviews on GoodReads. Thanks Jazmen, I'm really excited about it! Thanks Dale, and congratulations to you too!